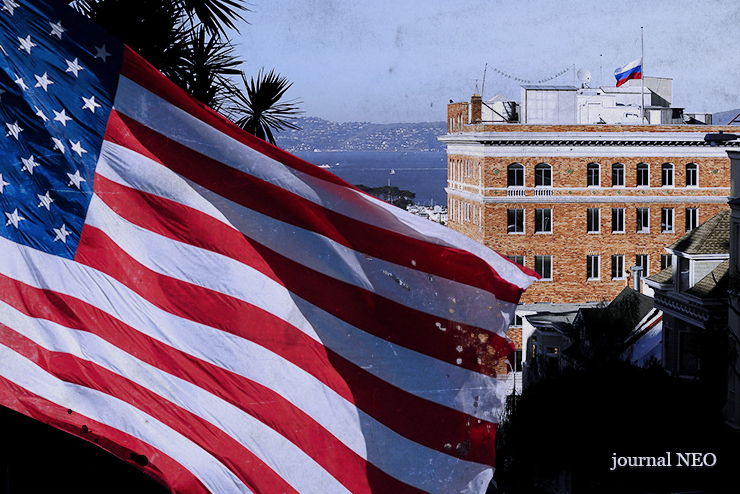 The United States of America has sunk to a new low in diplomacy and civilized relations between nation states with its demand that Russia close its consular missions in San Francisco, Washington and New York, quickly followed by its order that the consular staff leave the premises while the FBI conducted a search of the premises and staffers personal apartments. To order the closure of a mission, or to order the withdrawal of a member of diplomatic staff, is within its right but a search of consular property is not. It is a flagrant violation of the Vienna Convention on Diplomatic Relations of 1961. 1. “The premises of the mission shall be inviolable. The agents of the receiving State may not enter them, except with the consent of the head of the mission. 2.The receiving State is under a special duty to take all appropriate steps to protect the premises of the mission against any intrusion or damage and to prevent any disturbance of the peace of the mission or impairment of its dignity. The Vienna Convention is one of the foundations of international relations. Without it, and the ancient customs enshrined in it, international relations cannot exist. The United States of America is a state party to the Convention and so is bound by it as part of international law and as part of American law. The Russian Foreign Ministry correctly stated that, “the occupation of Russian diplomatic properties in the US is a blunt act of hostility and in violation of international law.” The Russians also expressed their logical concern that the only reason for such a search to be conducted, aside from bullying and intimidation of the Russian people, is to use it as an opportunity for the Americans to plant items, which they will then use in their propaganda war against Russia. This concern is valid and strong since there can be no valid reason to insist on the staff leaving the premises so a “search” can be made except that the US government does not want its FBI agents observed. This action by the USA is not just a crime against Russia. It is a crime against all the nations of the world who depend on the articles of the Vienna Convention to protect their diplomats and properties in host nations without which international diplomacy cannot be conducted. For if the USA will do this to Russia it will do it to anyone it chooses. No nation can now regard its diplomatic missions in the United States as protected, as the Convention requires. The ramifications will take a while to sink in but in effect the United States has now declared itself to be a rogue state that has no respect for its own or international law and the rights of other nations. It is also a profoundly stupid action that can only damage the United States itself since, by its own example, it can no longer expect other nations to respect the diplomatic immunity of its diplomatic missions around the world. So, why has the United States undertaken such a reckless and provocative action? There is no doubt that it is part of the bizarre and clumsy propaganda theme that Russia interfered in the American elections and so the “search” is meant to raise in the minds of Americans that there is something to be searched for, some evidence of a “crime.” Why this would be found in San Francisco is a mystery but the American government and media never seem to bother about logical plot lines in their propaganda stories. The other reason is to provoke Russia. The provocations against Russia from Ukraine, to Latvia, from Crimea to Syria, continue to escalate. The provocations on the diplomatic front have been many, but it was Obama that expelled 35 Russian diplomats just before he left office and ordered the seizure of two Russian compounds. The Russia government held off responding to that for several months, hoping that the new US administration would be more reasonable, but in vain. Things just got worse and so the Russians ordered America to cut its diplomatic presence in Russia. The American seizure of more Russian properties and the search of the San Francisco mission are in line with the American logic of hostility towards Russia. There we have it, The American government has become completely unhinged. They appear to have lost all sense of reality and can be said to be suffering from a type of psychosis and for all that are becoming more dangerous. A US government spokesperson stated that President Trump ordered this latest action, once again proving that Trump, for all his narcissism and arrogance, simply follows the long line of American presidents who have stirred up trouble in the world. So far as I can determine, no other country has conducted itself like this before, not even the United States. Even the Japanese were not treated this way after Pearl Harbor. The Japanese embassy was locked down, put under the control of a neutral country and the Japanese diplomats allowed to leave the country. That is, the United States then, even in the face of a direct military attack against it by Japan, still adhered to international law and respected diplomatic customs. So far has the United States declined into barbarity that it does not now afford to Russia, a fellow member of the United Nations, and with whom war has not broken out, the same courtesies that were applied to Japan, a nation that attacked it. In fact, by its action, it negates Russia as a sovereign nation, since it denies Russia is entitled to the respect and courtesy due to all sovereign nations. How indeed? I do not know but I do know that the nations of the world, including Russia, should pay heed to what Harold Pinter said, to think about it, to understand what the American action means at a deep level, and only then to respond accordingly.